Somerset County Freeholder Director Patrick Scaglione, Freeholder Mark Caliguire, Mayor Gloria McCauley, Committeeman Frank DelCore, Committeeman Carl Suraci, Committeeman Shawn Lipani, Township Administrator Anthony Ferrera, and Township Clerk Pamela Borek joined county Somerset Park Commission President Bill Crosby, Park Commissioner Scott Ross, Park Commissioner Helen Haines, interim Parks Director Geoffrey Soriano and former Somerset County Parks Director Ray Brown in unveiling a plaque at Mountain View Park in Hillsborough on Oct. 25. The plaque acknowledges the joint efforts of the Somerset County Board of Chosen Freeholders, Somerset County Park Commission and Hillsborough Township in bringing the park project to fruition. 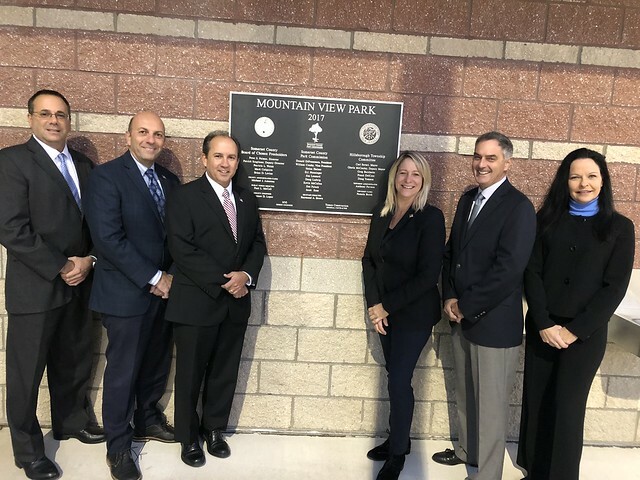 The state-of-the-art athletic complex at Mountain View Park officially opened in April 2017. Located at 141 Mountain View Road, it is on the site of the former GSA Belle Mead Depot. The park includes two adult baseball fields, four youth baseball fields, and one special-needs Challenger Field. All fields are lighted. Amenities include batting cages, a playground, a pavilion, a concession/restroom facility, a park maintenance facility and a paved perimeter multi-use trail with associated parking. The facility will allow the potential for future development of six additional baseball/softball fields.